Hacked Gadgets :: View topic - Extreme Noob needs help. Posted: Fri Dec 05, 2008 5:24 pm Post subject: Extreme Noob needs help. As it turns out, when i apply the 9 volts, the LED turns ON in a lit room and off in a dark room, opposite of what I want. This is my first try ever so Im sure its somthing easy but I need some help. Transistor (PN2 907A 339) At least that is what is written on it. of transistor. I used the only one I had. Turd Thanks for the quick reply, I made mine the way yours looks and it is still acting bass ackwards lol. could i have the wrong resistors hooked up? Im not sure why my setup would act like this. The 100K resistor should be: brown, black, yellow and then gold. The 470 ohm resistor should be: yellow, purple, brown and gold. And note the bare wire jumper from the emitter to the ground rail ( - ). Thanks man No one more question if you dont mind. 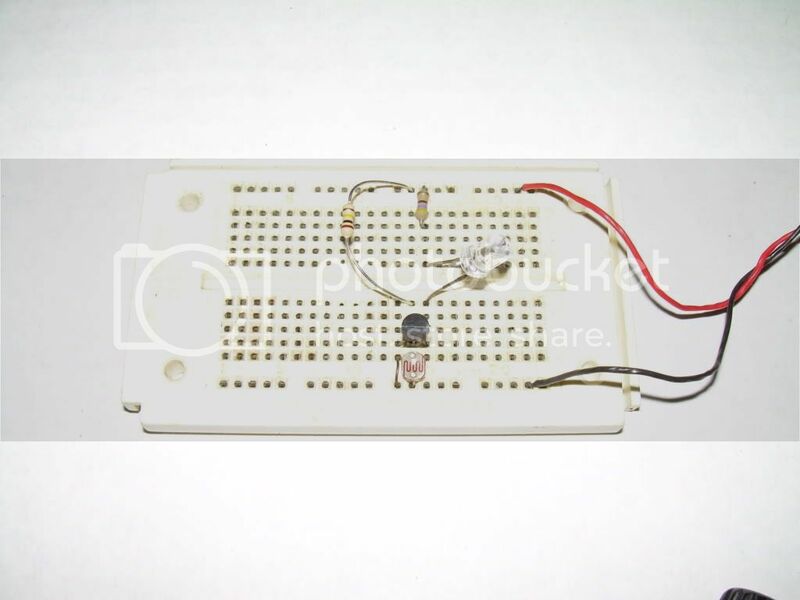 What would be an easy or best way to make that simple circuit more sensitive to light, to where it would only activate in a very dark place? You could change the 100K resistor to a 200K resistor (red, black, yellow, gold). If you don't have a 200K resistor use two 100K resistors in series. Hey there Turd, my simple circuit is working great. I wanted to ask you , if i wanted to switch my power supply to 3v (coin battery), how do i figure out the changes i would need to do with the resistors? What colour is the LED?